Sharon and I have retired from the boat charter business but continue to shoot undersea video. We have a fairly extensive gallery of video clips online. They are extracted from about 200 hours of video on DVDs. At the end of each day's shooting we burn DVDs from the recorder's hard drive. The recorder runs all the time the camera is in the water because you just never know what may turn up. Click on the video clips link to open the video gallery. Captain Jones, hiding behind the deck light, hails from the town of Harpswell in Casco Bay. His family first moved to town about 1640, AD that is. He draws his crew from a nearly inexhaustible supply of relatives in the region. Shown here is son-in-law Mike. Captain Jones is a former lobster catcher who served 20 years in the USN submarine service before taking up the charter trade. There may sometimes be an apprentice crewperson onboard. 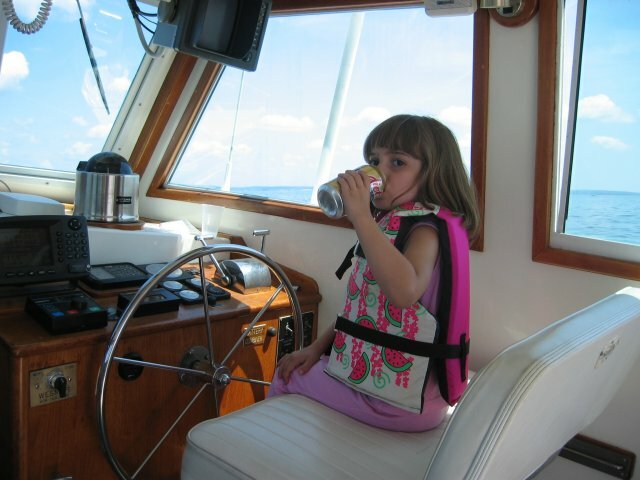 Cheryl is shown here, practicing handling a can of soda while piloting from the lower helm station. The pilot house seats six comfortably for viewing the underwater camera monitor. 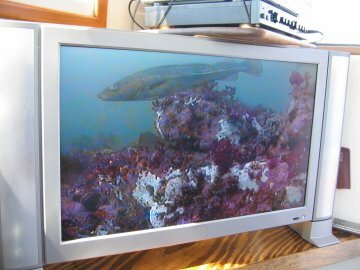 The wide-screen LCD flat panel monitor provides the real-time view of the underwater scenery. The video recording equipment sits above the monitor and makes a permanent record of whatever the camera sees while it is submerged. 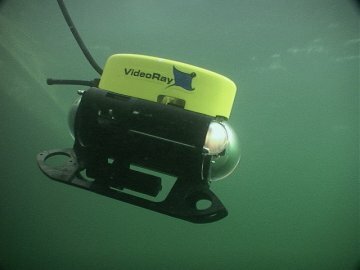 In 2006 we expanded our capability with the addition of a submarine remotely operated vehicle (ROV) manufactured by VideoRay of Phoenixville, PA. This micro submarine carries a video camera and swims through the water at the end of a tether. It is controlled from a panel onboard the vessel. 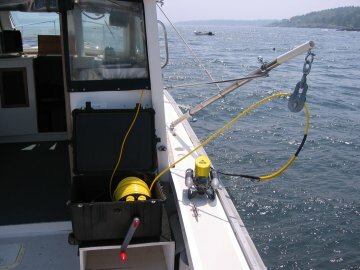 Since the tether is normally slack, the ROV is isolated from the motion of the boat and subject to the same forces from wave action as are the fish in the water. 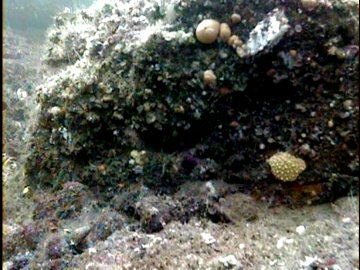 You get a true diver's eye view of the undersea world. The whole ROV system fits into a suitcase sized carrying case and is available for submarine inspections, search and recovery operations, diver monitoring or any underwater use that you might need. It may be deployed from our vessel, from your vessel or from shore. Casco Bay is the home territory for NAUTIC Video. 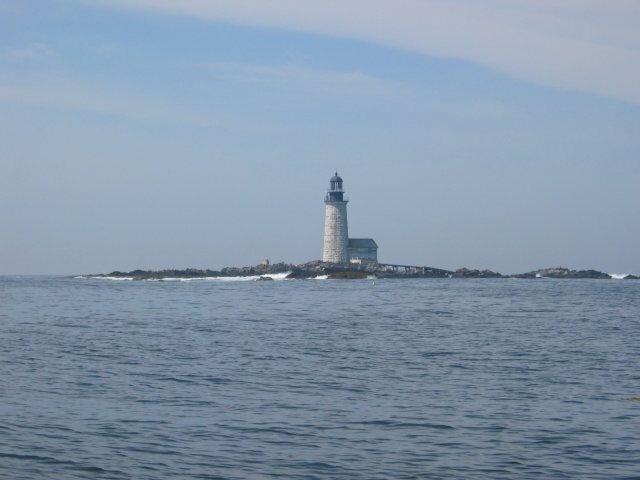 The seaward boundary of Casco Bay extends 16 miles from Cape Elizabeth, southeast of Portland, Maine, to Small Point, southwest of the mouth of the Kennebec River. The bay extends about 20 miles inland from this line to the town of Brunswick, Maine. Halfway along the line from Small Point to Cape Elizabeth is one of the most remote lighthouses on the Atlantic coast, Halfway Rock. 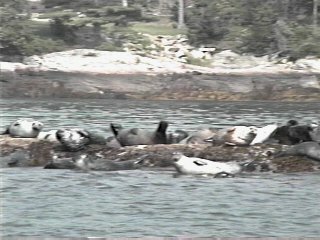 Harbor seals are the most common marine mammals in Casco Bay. 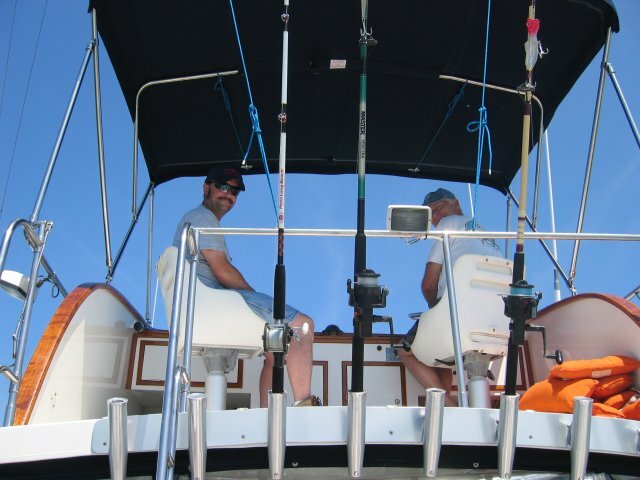 They spend much of their day fishing for mackerel or bluefish and stealing lobsters and bait from lobstermen's traps. The rest of the time they lay around in the sun on low-lying ledges where they dry out, get warm and squabble over who gets the best spot to lay on. We can find them nearly every time out on some rock or other. Casco Bay is visited by several kinds of whales. These include humpbacks, finbacks, minke and rarely a right whale. In 2004 there was a beluga whale, one of those small white arctic critters, in the Bay. 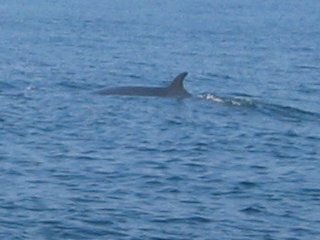 The whale shown here is a minke whale about 25 feet long. The subject here is a Cancer irroratus, sometimes called a peekytoe crab. This guy is inspecting the ROV. He later climbed onboard for a little ride. 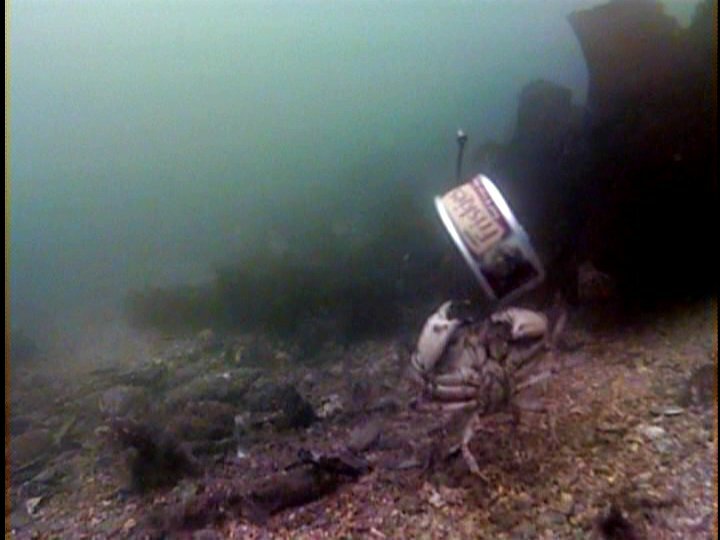 This crab is jumping up and down trying to capture a can of cat food that has been punctured to let the juices out and hung in front of the camera. 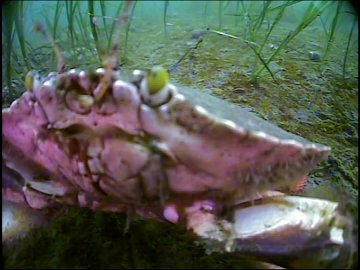 Crabs are found nearly everywhere at all depths down to the 300 foot limit of our video cable. When at rest they tend to crawl under rocks and into crevices for shelter. Almost any bait will serve to bring them out to investigate. 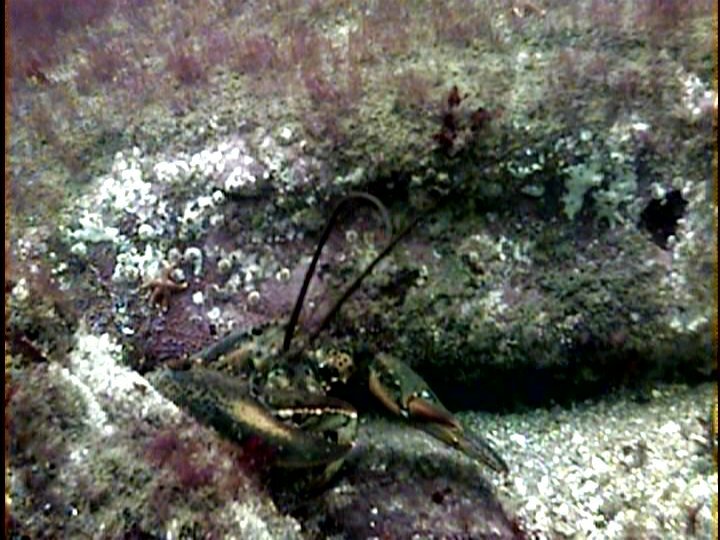 The lobster, Homarus americanus, also rests in hiding places either natural or excavated by the lobster. This one has partially emerged to find out what thumped down near its doorstep. Deciding that the camera was not a threat, nor good to eat, it disappeared back into its hole after a few seconds. 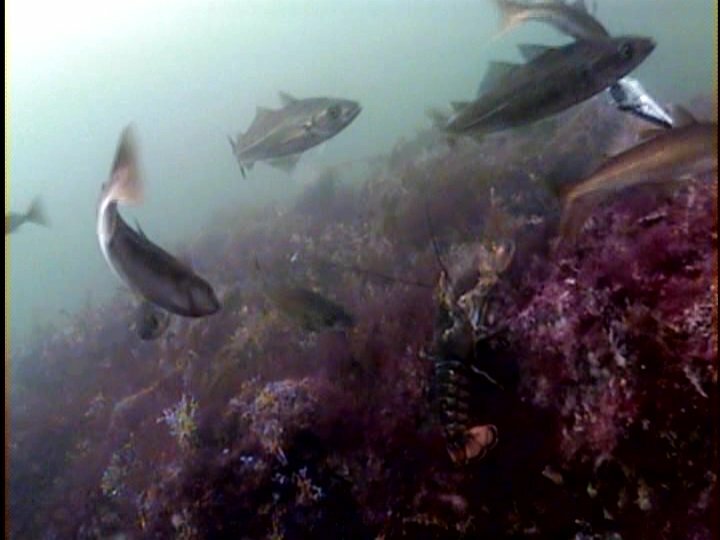 Lobsters are mainly nocturnal animals and the video equipment works a lot better in daylight. 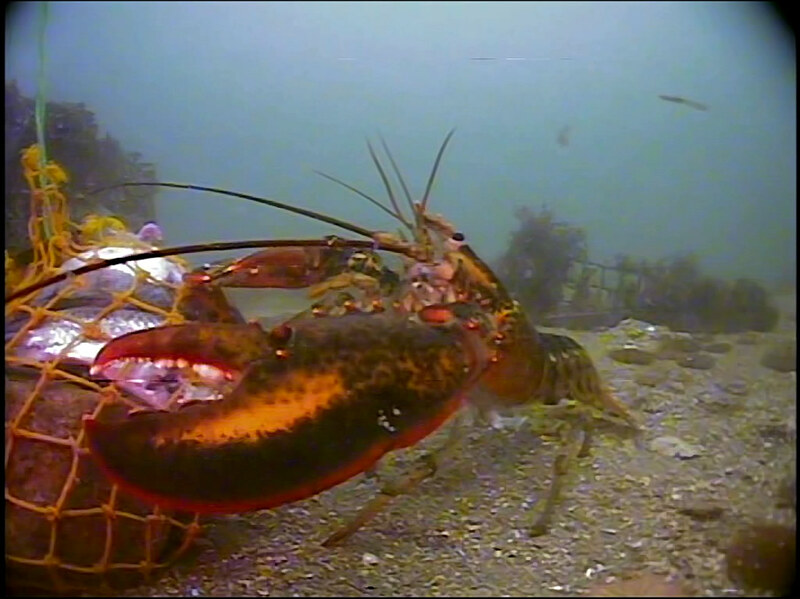 To entice lobsters and other creatures into camera range we sometimes put some bait in the ROVer tether ballast bag. This lobster made a game attempt to steal the bag, rocks and all, but it was too heavy. 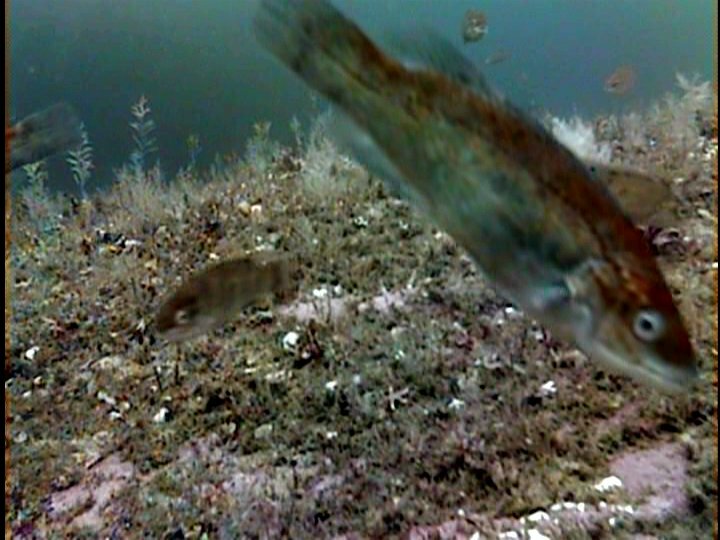 Cunner are often found in groups around the offshore ledges. 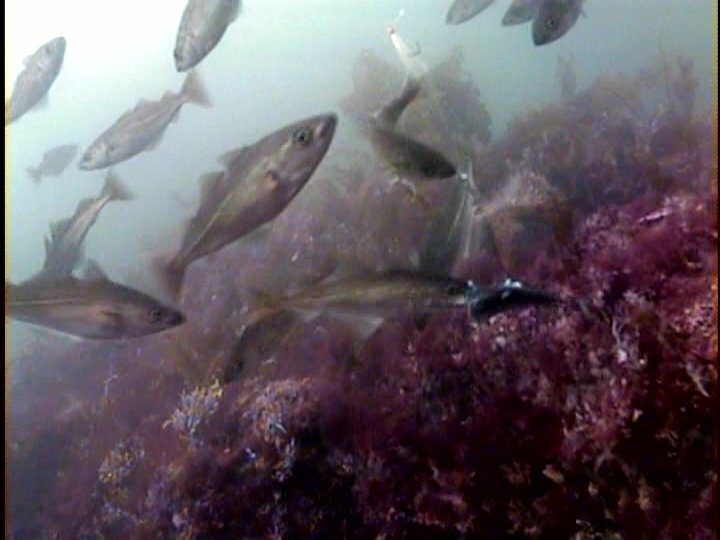 They don't seem to congregate in close packed schools like some fish but are rarely isolated individuals. They may be mottled red and white or brown and white, zebra striped or fairly uniform in color. It is their size and shape that distinguishes them as cunner. 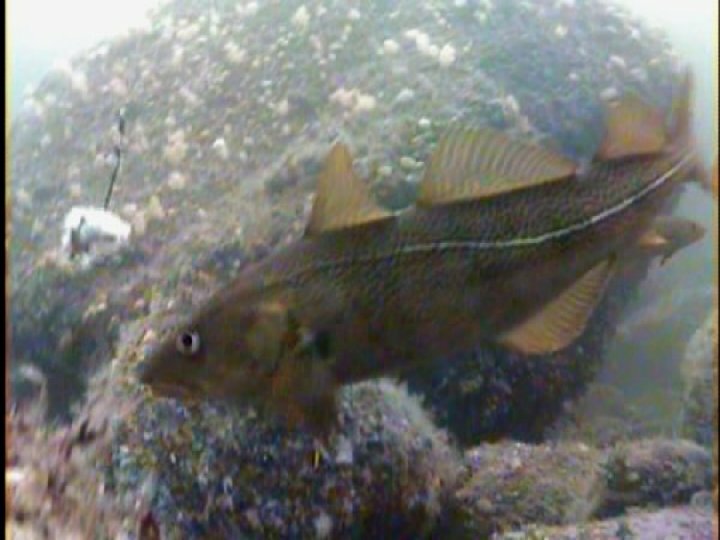 Pollock, Pollachius virens, do school together in tight groups. Sometimes several hundred individuals may be involved in a school. Offshore pollock fall between 4 and 15 pounds in weight, although large ones can weigh to 35 pounds. Around the shores they are plentiful in the 1 pound or so size. We call these little fish harbor pollock. You might notice the lobster climbing the ledge in the background. 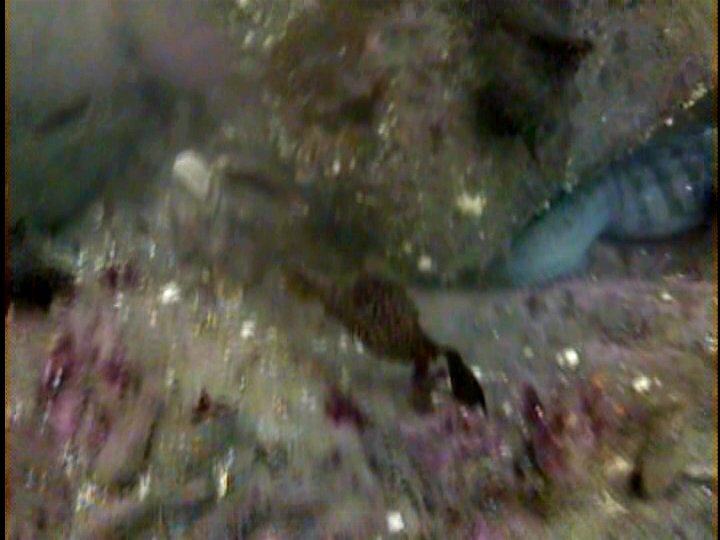 He is interested in the bit of bait suspended from the camera, not in the pollock. 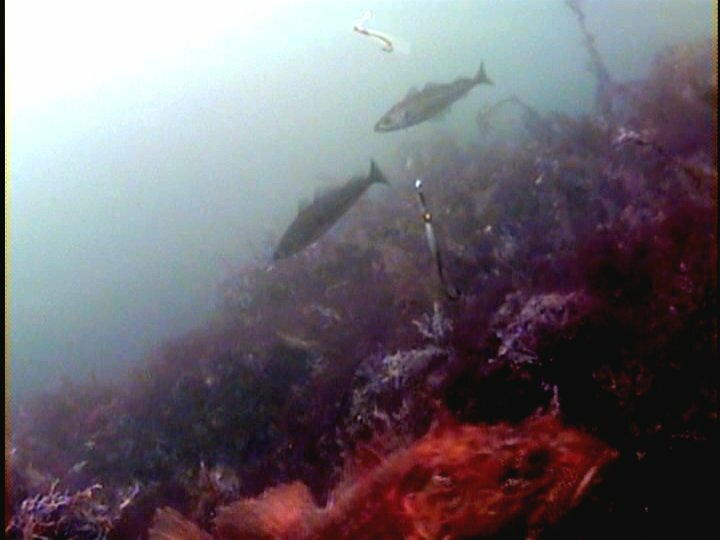 These pollock are attracted to a bit of dead mackerel hung from a pole attached to the camera tripod. Even a small pollock can put up a respectable fight on very light gear... And they make a pretty good chowder. 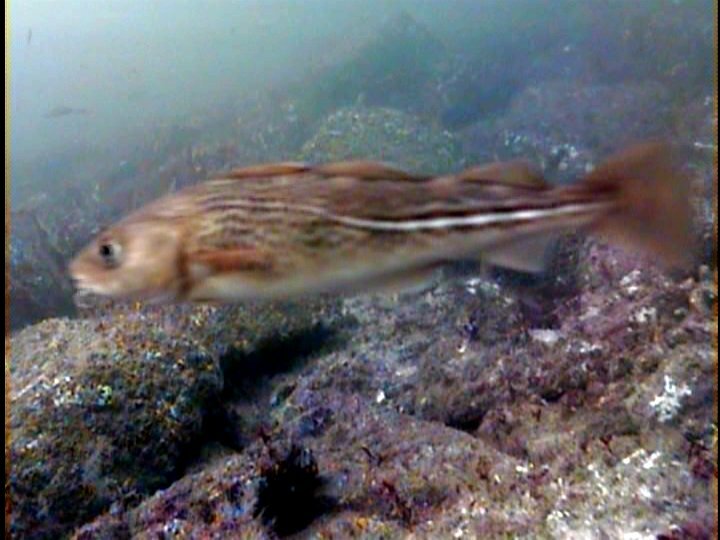 Once among the most common of the Bay's fish, the cod, Gadus morhua, is now much more scarce. They are seen most often as isolated individuals rather than groups. They may be taken by anglers in limited quantities if the overall length is greater than 22 inches. Large individuals may weight about 50 pounds but are rarely seen in the Casco Bay. The cod at the left may be a keeper but probably not much over the 22 inch limit. It displays one of the lighter colorations. The cod at the right is studying the bait but ultimately refused to nibble it. It is larger than the cod above and displays the more typical finely spotted coloration. If fish are accidently caught on the camera's barbless bait hook, we release them. 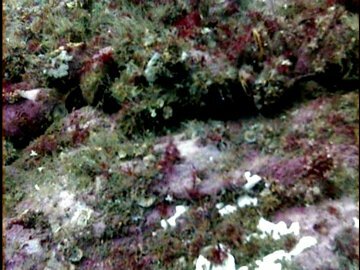 Not all the fish we see are easily identified. This critter was glimpsed under the rock as shown here. We think that this is about 20% or so of a wolf fish. They are reclusive but territorial so if we can find this rift in Lambo Ridge again, we will have another look for him. Not all the identifiable fish are all that attractive. The sea raven, Hemitripterus amaricanus, lives on rocky bottom and eats anything that will fit in its large mouth. This one lunged up from somewhere below and scattered the pollock that were in the vicinity. Every sea creature has its place in the food chain and among the visible animals these fish are near the bottom. They are herring, and are eaten by just about every fish that finds them. 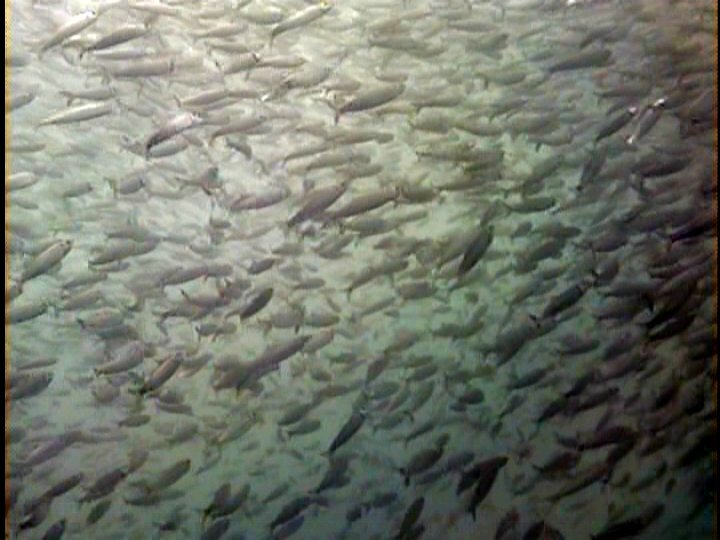 The dense schooling behavior is a survival technique, protecting the fish in the center by sacrificing those at the edges. 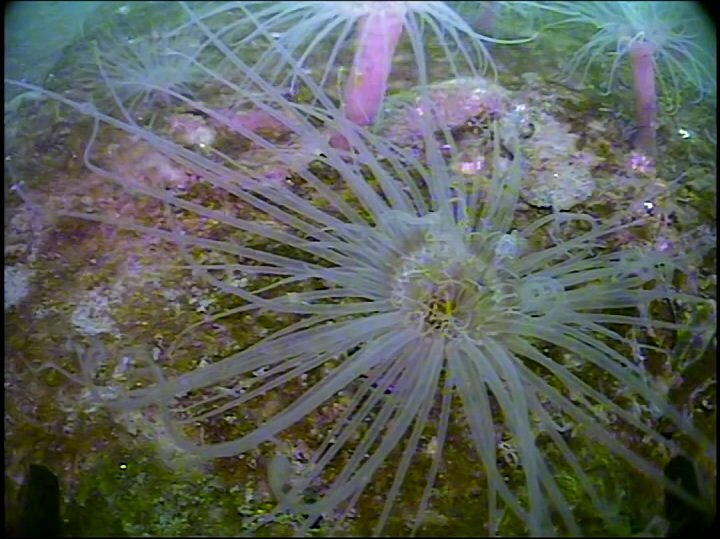 Much of the sea bed is covered with plant and animal growth. Plants and animals are pretty well mixed. There are plants growing on animals, animals growing on plants and animals growing on animals. See if you can sort out the examples in this picture. No one in our office can do it. 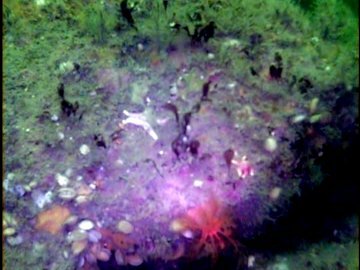 In fact if there are any marine biologists viewing this site, we would like to hear from you. 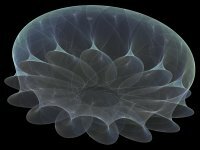 We need help identifying much of what we see. I suspect that these pebbly and smooth objects shown at the left are animals but can't say for sure. If you look closely at the red object near the bottom of the picture at the left you will see many branches on it. We guess this is an animal called a scarlet psolus. The "p" is silent as in "Psmith". The camera light was turned on in this instance so as to see more clearly the red color, which tends to appear gray as depth increases.